Dr. Michael Andreaggi received his Bachelor of Science, Life Science degree in 2009 from the Pennsylvania State University at University Park. He received his Doctor of Optometry degree from the Pennsylvania College of Optometry (Salus University) in 2013. Therapeutically licensed to treat all eye disease, Dr. Andreaggi enjoys providing comprehensive eye care to patients of all ages. Receiving clinical honors during rotations in hospital and contact lens specialty services alike, Dr. Andreaggi specializes in contact lens comfort, dry eye syndrome, treatment of glaucoma, and post-operative LASIK and cataract procedures. Dr. Andreaggi resides in Timonium with his wife and maltese-poodle. He enjoys sports of all kinds, music, and the outdoors. 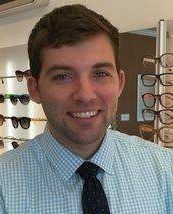 Dr. Andreaggi is a member of the American Optometric Association and the Maryland Optometry Association.